Place the vanilla extract, vegan butter and aquafaba in a bowl and beat with a hand mixer, or in a stand mixer, until fluffy, about a minute. Add in the confectioners sugar and mix it in. Add the two flours and mix in. Your dough should form at this stage. It will look a little dry but will hold together. If it doesn't come together at all, add a few drops of aquafaba until it does, but be careful-- it should not get sticky. Roll out the dough to 1/4th-inch thickness on the countertop. Dust the countertop, if needed, with cornstarch but you should not really need to if your dough is at the right consistency. 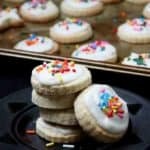 Cut out your cookies using a cookie cutter. Place them at least a couple of centimeters apart on a cookie sheet. Bake 7-8 minutes or until the cookies just start to brown. Do not overbake. Remove and let them cool for five minutes on the cookie sheet. Then, using a spatula, transfer to a rack to continue cooling. Place the sugar in a bowl with the butter, nondairy milk, and vanilla extract. Mix well with a fork, then beat with a hand mixer until fluffy and smooth. Use a knife or an offset spatula to frost your cookies. If you wish, add some natural food coloring, or add some sprinkles!